featured artists: Anaamaly, Alan Brown, Alex Crispin, Tapes & Topographies, Tim Linghaus, Taylor Deupree, Halftribe, Benjamin Finger, Confluent Phase, Hirotaka Shirotsubaki, Overlap, Olivia Summer, Elrox, William Bowden, Andrew Heath, Steve Roach, Delia Derbyshire Appreciation Society, Bruno Sanfilippo, Levete, Ishq, Dalot, Relaxation Synthesis. 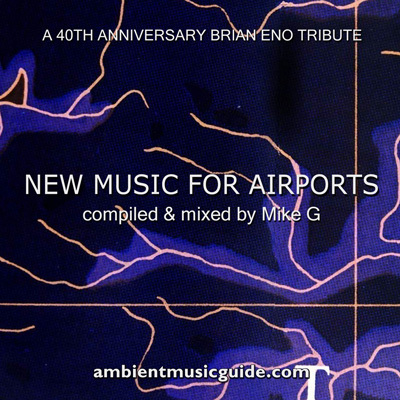 2018 marks the 40th anniversary of Brian Eno's epochal album Ambient 1: Music For Airports. In the spirit of Eno's original manifesto to create music "designed to induce calm and space to think", this two hour mix gathers 26 outstanding pieces from various artists around the world. All tracks in the mix are lifted from new or recent albums, with the exception of the sublime "Arc" by Ishq (released 2001).